Many of us who are aurora chasers have very understanding partners. Those of us who feel the call of the lights, who spend lots of the wee small hours standing in the freezing darkness, are blessed with significant others who tolerate, understand and support our nocturnal expeditions. But surely, despite all this tremendous understanding, there is one night when we would be pushing things just a little bit too far if we requested permission to head out. One night that should surely be preserved for the one we love, whatever might be happening in the skies above. The partially earth-directed CME that was launched by the sun on 11th February. Space weather forecasters were suggesting a possible glancing blow for the earth late on 14th/early 15th February. So it was with mixed feelings that I greeted the news of a possible CME arrival late on the night of: St Valentine's Day, 2016. What if, in the middle of some romantic meal somewhere with Mrs H, new started filtering in of a big aurora storm? Would I have the guts to ask? Would it go down well with the exceptionally understanding Mrs H if I did? I suspected I knew the answers to those questions, even before I asked them! So as Sunday 14th approached, I found myself in two minds - of course I wanted to see an aurora (especially as the last one I had seen was over 6 weeks before on New Year's Eve); but, at the same time, I would have been quite happy for it to be late to save any awkward situations! And, as it turned out, not only was it not late, but it seems that the CME didn't appear to arrive at all. Where did it go? There is always a margin of error in forecasting the timing of a CME. But it didn't seem to affect us at all. What happened? There are various theories out there (including the fact that it may have missed us entirely, or that it may not have been strong enough to produce any noticable impacts), but whatever happened to it, the week that followed was a good one for aurora chasers in the mid-latitudes courtesy not of a CME, but of a Coronal Hole High Speed Stream (CH HSS). In this blog, I'm going to take you through the week's actions, focusing especially on my viewings on Wednesday 17 February, to give you some understanding of what happens during a CH HSS impact. What is a CH HSS? There are two huge coronal holes visible on this solar image from 19th February. 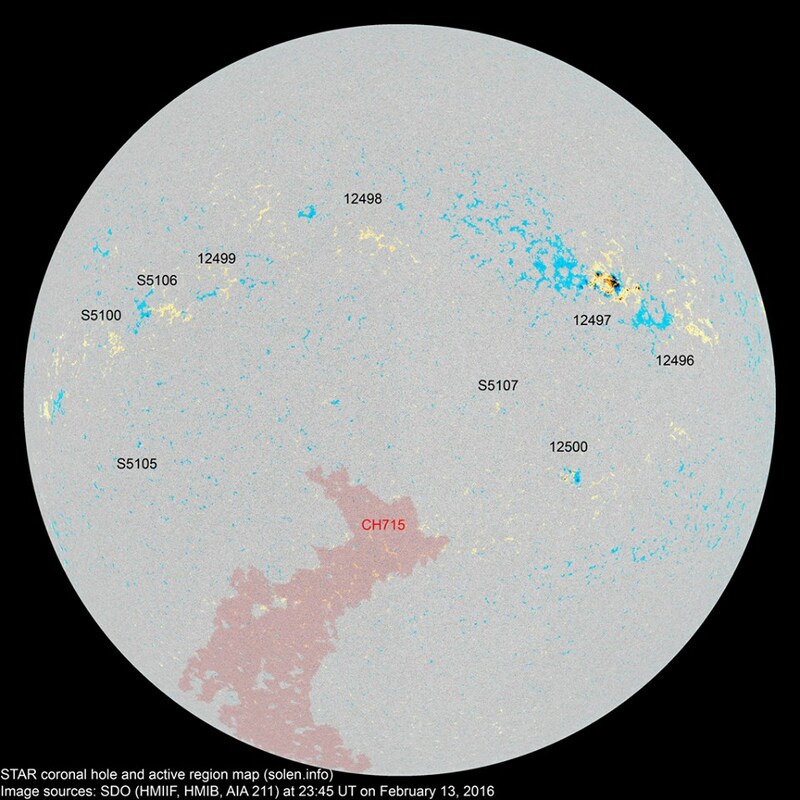 The one that produced the activity around the 17 February is the one to the southern pole of the sun. Coronal Holes are areas in the sun's corona where higher speed solar winds can escape more easily. This is due to the magnetic field lines here: whereas, in most other places on the sun's disc, the magnetic field lines loop out and then loop back in again, in contrast in a coronal hole the magnetic field lines stretch out into space. This allows the solar wind material to escape at high speeds. And, if the coronal hole is pointed towards the earth, they Coronal Hole High Speed Streams can be a source of aurora activity for us on earth. The higher speed of the solar wind, if it is combine with a negative Bz, can produce mid-latitude auroras. And this is exactly what happened with CH 715! As southern polar coronal Hole 715 rotated with the sun, an extension of it rotated into a geo-effective position (a position where it would affect the earth). This sent a faster solar wind towards us that was due to impact around the 16 February. The expected impact of the CME from 11th February doesn't make any obvious appearance. As it was only ever forecast to give us a glancing blow, did it miss us entirely? Or was it too weak by the time it arrived to produce any effect? We can't be certain - but, despite this disappointment, the CH HSS from CH 715 still had a chance to give us some action. Late on the 15th and into the wee small hours of the 16th, the CH HSS arrived and the ACE satellite started to pick up its effects. In particular, the solar wind speed started to pick up, and the Bt (the strength of the Interplanetary Magnetic Field - the IMF) began to rise slightly and the Bz became more erratic. That night, we were clouded out in Northern Ireland. But dedicated aurora chaser James Rowely-Hill was out and about chasing in Norfolk, and here is a time lapse of what he saw on Monday night/Tuesday morning. It was a frustrating night for aurora chasers across the British Isles. The magnetometers were twitching, showing that there was a strong chance for some aurora action. But most of us were covered in cloud and so very few reports of sightings came in. The Coronal Hole Stream was still affecting the earth on Wednesday. The overall field strength of the IMF was quite weak, but the solar wind speeds were staying elevated at close to 550 km/s. And, at last, we had a clear forecast for the skies over Northern Ireland. Although a bright moon would be in the skies, all it would take was a decent stint of negative Bz for there to be a chance of action for me that evening! And, as we moved towards the hours of darkness, the Bz swung south at 18.30 - and stayed there until around 23.30. So the ducks were lining up: clear skies; hopeful looking statistics; and, one final wee duckie, there was some snow on the ground! I've long wanted to capture an aurora in the snow. The cloud that spoiled our view the night before kindly dumped a little bit of snow over much of Northern Ireland. As the day progressed, much of it melted. But I was hopeful that my favourite viewing location at Slemish Mountain would be high enough to hold on to a bit of it - and it was! I arrived in location around 21.30 and I got my Fuji X-T10 set up, along with my trusty Nikon D7000. The moon was bright in the sky, so the display would need to be a good one to cut through the ambient brightness. But my first test shot revealed a faint green glow just above the horizon. We were game on! This was my first chance to properly test out the Fuji with a full aurora show, and I was keen to use it for my time lapse, while shooting other shots with my Nikon. And wow did the Fuji deliver! The detail and features I was able to pull out were great, and I settle myself down for what I hoped would be a great show. And indeed it was. With the magnetometers twitching away, the display was quite active from my location. There was one main, higher arc, and it built up in intensity towards 22.00 hours. At around 22.00 too, a lower arc just about became visible at the horizon line. From the photos shared by other UK aurora chasers, this one had a vivid yellow and red colour - if you look carefully at my image, you can see those hues just about showing on the lower arc as well. Over the next 20 minutes or so, the display built up, with some structure and rays showing on camera, and just about visible to the discerning naked eye! When you're out aurora chasing in the wee small hours, you normally get so caught up in the moment that you forget you're standing in a remote area in the dark. But this night, there was something that happened that jolted me back into the reality all around, rather than that high up in the skies above. In the stillness of the cold air, I suddenly became aware of a sound - something was charging down the darkened country lane towards me! I quickly turned my head towards the source of the sound, peering into the gloom up the road. My first thought was that a horse had escaped and was galloping down the lane towards me - and my camera gear. But, as the shape got closer, I realised it was more human in appearance. What could it be! A few more steps revealed the truth - it was a jogger, complete with jogging shorts. But wait: a jogger? At 22.30 hours? In the dark? Along an icy lane? Come on - who even does that?!? But, as I mumbled a greeting as he ran past (without breaking his stride), I thought to myself that he could have been thinking just the same thing: a photographer? In the dark, photographing a field? On an icy lane? Come on - who even does that?!? Fair point! So, after getting a bit of a scare, I turned back to the business in hand - aurora chasing. Just when I thought the display was going into decline, as the greens began to lose their intensity, a faint set of rays passed east to west across the sky in the very faint purple band. Around 23.30, I called it a night. Here's a time lapse video of the entire night's display. Although the CH HSS continued to affect us, the display on the Thursday night was much less impressive, visible only to the more northerly parts of the UK. The solar wind speed continued to decline and, although the speed was still above ambient levels, there wasn't anything much reported to be happening that night. So, so this aurora chaser at least, it turned out to be a win-win situation this past week. 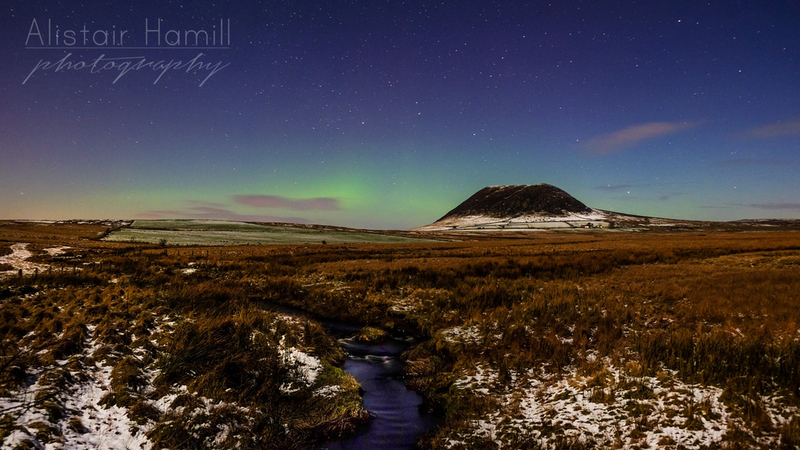 A great Valentine's Day date with Mrs H last weekend, and my first snowy aurora pictures!